Musical history is full of magnificent torsos; works by major composers from Mozart (Requiem), via Bruckner (Ninth Symphony) to Bartók (Viola Concerto) that have been left incomplete. In many cases, it has been possible to create ‘performing editions’, such as those by Deryck Cooke of Mahler’s Symphony no.10, or Anthony Payne of Elgar’s Third. So it is exciting to find an unfinished piece of Shostakovich on this disc; his Violin Sonata, started in 1945, but incomplete save for 5:45 of the (presumably) first movement. Alfred Schnittke was apparently approached to see if he could re-construct the work, but felt there simply wasn’t enough to work from. 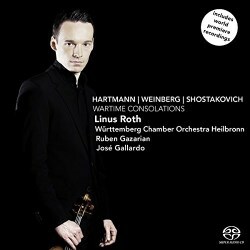 Nevertheless, it is a substantial coup to be able to present it here, performed by the brilliant young German violinist Linus Roth, with José Gallardo at the piano. It is quite a shock when the piece suddenly evaporates in the middle of a piano phrase. That said, it is emphatically worth hearing, both for its great inherent beauty, and because some of the themes and motifs that were later to be used in the Tenth Symphony. The Shostakovich comes as a kind of ‘bonus track’ after three works for violin and strings, performed by Roth and the excellent Württemburg Chamber orchestra under Ruben Gazarian. The programme is well chosen; Karl Amadeus Hartmann, featured on tracks 1-4, was a contemporary of Shostakovich. Although not Jewish, he suffered greatly during the rule of the Third Reich, yet survived the war and managed to pursue his musical career after it. The Concerto Funèbre of 1940 is an undoubted masterpiece, a work of great power and utter commitment, which has been ‘discovered’ by many fine violinists in recent years, including Zehetmair on Warner Apex, Ibragimova on Hyperion and Spivakov on Naxos. Roth and his partners give a thrilling and truthful account, which digs deep into the pain at the heart of the work. It’s important to note that the link with Shostakovich is a concrete one, for the theme used by Hartmann as the basis of his final movement is a Russian funeral song, ‘Eternal Memory’, which crops up again in Shostakovich’s Eleventh Symphony of 1957. Much gentler, at least to start with, is the Concertino by Mieczysław Weinberg – his name is sometimes rendered as ‘Vainberg’ – composed in 1948, but not performed until after his death. Again, the Shostakovich link; Weinberg was one of the composers, along with his illustrious colleague, to be hauled across the coals in the Soviet Composers’ Union Congress in 1948. He was Jewish, which counted crucially against him; but this Concertino is a superb and unjustly neglected work. The first movement has a slightly distracted charm, the second is intense and highly charged but it’s the waltzing third movement that is the real winner – unforgettable with its hypnotic fairground theme. The Rhapsody on Moldavian Themes comes from a little later in Weinberg’s career. Although it is something of an outpost of a tradition that includes Kodály’s Dances of Galánta – or indeed Copland’s El Salón Mexico – it is a thrilling and bracing piece, given a rollicking performance here; seriously exciting. So this disc is an important and absorbing issue; terrific music played with total conviction by an outstanding soloist and fine supporting orchestra but that ‘headline’ quality is supplied by the tantalising Shostakovich fragment.